This equipment is used for twisting copper strand, aluminum strand, steel strand, steel-cored aluminum strand and wire rope. After coiling, it can twist insulation wire and some control wire. 1. The machine can work steadily with the whole holder, and the protect cover adopts high grade seamless steel tube, so the structure is also steady with lower noises. 2. The timing power can be manipulated easily to adjust the speed .The protect cover has the right and reverse direction circumrotate. 3. The main machine and the haul-off unit adopt shift gears case, so the working intensity is lower and the pitch is exact. 4. Equipped with automatic parking equipment -the safeguard, it means the machine will stop when the thread runs out or the door is open. Rear-positioned pay-off, mainframe, tape lapper, haul-off unit, take-up and electrical system. 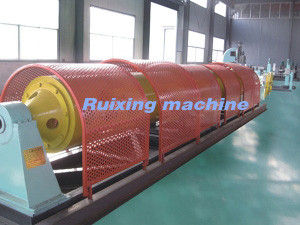 Ruixing Electrical Machinery Co., Ltd.